"Ranofer tried the box first. He found nothing there... The chest looked no more promising... There was something dark and curving in a corner, wrapped in a scarp of cotton rag... He tugged it out, jerked the cloth away impatiently and went numb all over with the shock of what he saw. There in his hand lay a gold goblet, he knew it must have been stolen from one of the great tombs in the City of the Dead. 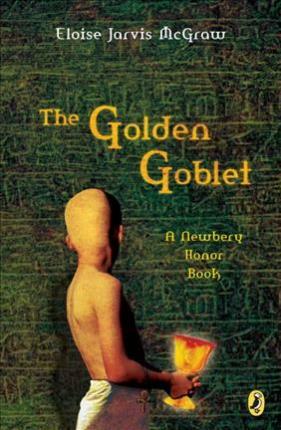 Ranofer also knew that in order to win his freedom he would have to prove that Gebu, his greedy half-brother, was the thief. The events that follow will surely excite the adventurous reader. Eloise Jarvis McGraw (1915-2000) was a writer for more than fifty years and was the author of more than twenty children's books. She has won many honors and awards for her books, including the Newbery Honor, which she was given for her books Moccasin Trail (1952), The Golden Goblet (1962), and The Moorchild (1997). Eloise Jarvis McGraw died at the age of 84 in Portland, Oregon, on November 30, 2000.